In the past couple of months, the GSMA Ecosystem Accelerator has been researching tech hubs in Africa and Asia in order to learn more about these stakeholders who are essential to the promotion and support of its Innovation Fund. Through this exercise, we have gained a better understanding about the leading tech hubs in these regions and how successful they are at empowering the start-up ecosystem. The last mapping exercise done by the World Bank in September 2015 listed less than 120 tech hubs in Africa. 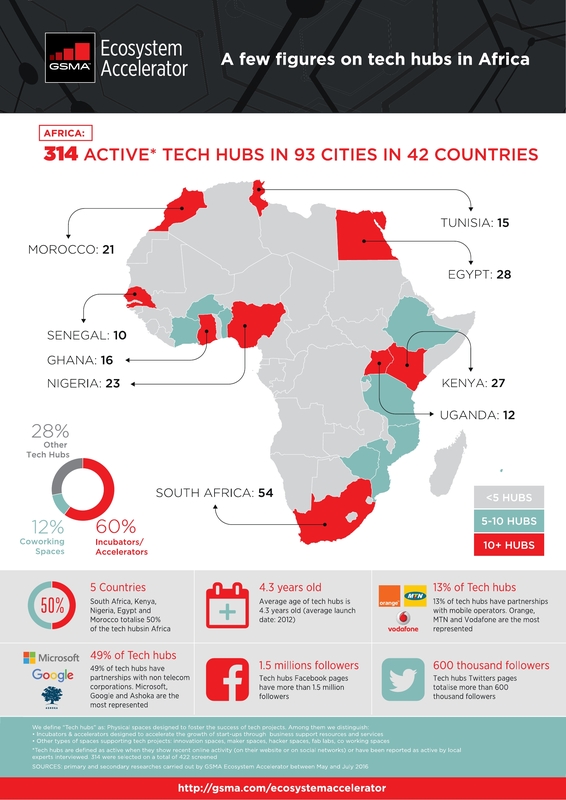 As of July 2016, our research suggests there are 314 active tech hubs in Africa (a number aligned with Disrupt Africa’s prediction in this March 2016 article), and 287 in South and Southeast Asia* , a number that keeps on growing on a weekly basis. How can we explain such a proliferation of tech hubs in Africa and South and Southeast Asia? For the purpose of our landscaping exercise we have been looking at all kinds of physical spaces that fall under the broad term of “tech hubs”: incubators, accelerators, co-working spaces, fab labs, makerspaces, hackerspaces and other innovation spaces. Incubators and accelerators – which provide start-ups with business support resources and services to help them scale – account for almost 60% of these tech hubs. Incubators and accelerators usually facilitate access to three critical resources for start-ups: skills, funding and network. Successful start-ups like ClaimDi (supported by DTAC accelerator program in Thailand), Kudobuzz (supported by MEST incubator program in Ghana) or People Input – (supported by CTIC Dakar in Senegal) are examples of the enabling role played by accelerators and incubators in Africa and South and Southeast Asia. Other types of tech hubs also play a crucial role in the innovation ecosystem of these countries as they facilitate access to technology and digital tools. A tech hub like Black Girls Code for instance, which enables young girls to access computer science technology in Johannesburg, illustrates well, how tech hub support goes beyond the traditional incubation or acceleration programs. Eventually, it is this “facilitator” role of tech hubs, irrespective of their type, that explains their success and proliferation in those regions. In Africa, although 50% of the tech hubs are concentrated in 5 countries (South Africa, Kenya, Nigeria, Egypt and Morocco), almost each of the other African countries have at least one or two active tech hubs. Moreover, we have identified some leading countries by sub-region when it comes to tech hubs: Morocco, Tunisia and Egypt in North Africa; Nigeria, Ghana and Senegal in West Africa; Kenya and Uganda in East Africa; and South Africa in Southern Africa. 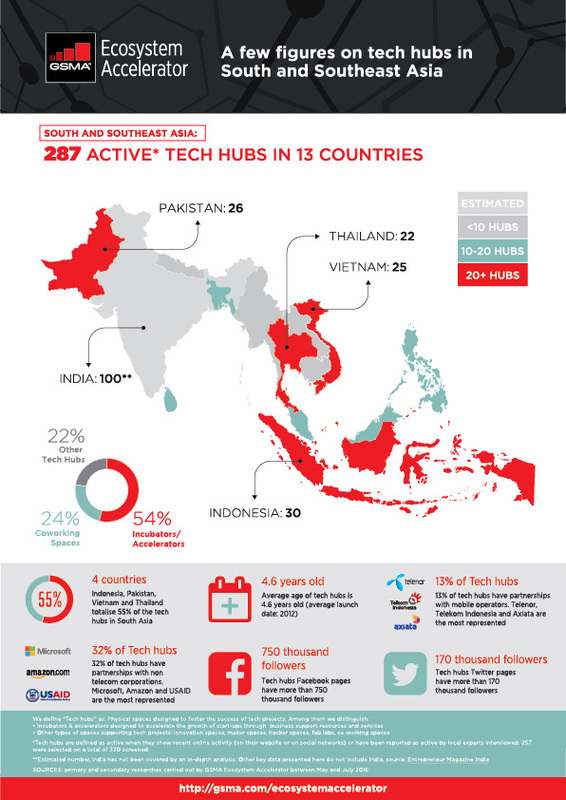 A similar analysis in South and Southeast Asia shows that 4 countries outside of India (Indonesia, Pakistan, Vietnam and Thailand) are home to more than 50% of the tech hubs in the region. Some smaller markets also have a number of fairly active tech hubs; for instance, we have identified 7 active tech hubs in Myanmar. • While in most South and Southeast Asian countries we could find existing open source listings of the different stakeholders (start-up events, tech media, co-working spaces, incubators, venture capital funds), it is very difficult to find such sources in African countries. • There is a higher number of co-working spaces in South and Southeast Asia which could be illustrative of the fact that start-ups have a better access to funding and support outside incubators/accelerators and hence just look for a space and community. • South and Southeast Asia (excluding India) has a smaller number of tech hubs per capita (1 tech hub for 5.3 million people vs. 1 for 3.5 million people in Africa) with a less fragmented territory (11 countries vs. 56 countries for a similar population). This difference illustrates the fact that tech hubs are still mainly local structures in emerging countries and do not usually cover several countries at once. Even though franchisees and hub alliances are developing across regions, every tech hub remains independent. Founder Institute, Rlabs, Jokkolabs or Impact Hub are examples of well-known international tech hub organisations with strong local presence. Jokkolabs for instance, started in Dakar in 2010 and now has active hubs in Cotonou, Ouagadougou, Abidjan, Banjul and Casablanca. All these spaces remain independent but share and respect a same set of values – “the coworking manifesto”. The goal of leading tech hubs is not only to offer space and services to start-ups but also to create a large community of stakeholders (partners, start-ups, investors etc.) Social networks are often a powerful tool used by tech hubs to build up these communities. The 500+ active tech hubs we researched, cumulate more than 2.2 million followers on Facebook and 800,000 on Twitter as of July 2016. Measuring online activity (number of likes on Facebook or Twitter, frequency of posts on their blogs or LinkedIn, websites updates) has been a good way for us to assess how active these hubs were depending on regions, countries or type of hubs. Among the most active, we found not only the well talked-about BongoHive in Zambia, Co-creation Hub in Nigeria, iHub in Kenya, Plan9 and Nest i/o in Pakistan but also lesser known and more recent organisations like Buni Hub in Tanzania, Saboutech in Guinea, Jumpstart in Pakistan or Enterprise-Nepal Business Incubator in Nepal. Another way to build up communities for these hubs is to develop partnerships with different types of organisations. Our study shows how well tech giants are involved: with 65 partnerships with tech hubs across the two regions we studied, Microsoft, Google and Amazon are by far the most engaged. Through these partnerships, they usually provide start-ups with both financial support and free (or freemium) access to their products. For example Amazon’s Activate is a package designed for start-ups in select accelerator/incubator programmes and offers them up to $15K worth of Amazon Web Services over a period of 2 years. Mobile operators are also increasingly involved in the tech hub scene. 13% of the active tech hubs we researched, have a partnership with a mobile operator. In Africa, Orange, MTN, and Vodafone are the leading partners (e.g. Cipmen-Orange partnership in Niger or ActiveSpaces-MTN collaboration in Cameroon) while in South and Southeast Asia Telenor, Telkom Indonesia and Axiata are the most active (e.g. Venture Engine-Axiata partnership in Sri Lanka or Phandeyaar-Telenor partnership in Myanmar). Like for tech giants, these partnerships are relevant for both parties. Supported start-ups usually get a facilitated access to mobile operator’s assets (APIs, sales and distribution network, branding etc.) while mobile operators get access to local innovation. Some mobile operators even decide to launch their own in-house programmes. For instance, as part of a group-wide initiative called “Make your Mark”, which focuses on ‘helping young people shape their future’, Mobilink in Pakistan collaborated with Lahore University of Management Science’s center for entrepreneurship to scout, mentor and provide support to start-ups. The GSMA Ecosystem Accelerator programme has launched its innovation fund on the 26th of July 2016 to support start-ups in Africa and selected Asian markets: gsma.com/innovationfund. Our support package includes funding, mobile-focused mentoring and technical assistance, and the facilitation of relationships with mobile operators. In this context, we are working closely with leading local tech hubs which we believe are best positioned and equipped to identify and support start-ups locally. *India was not in the scope of our analysis as the maturity and size of its start-up ecosystem makes it difficult to compare with African and South Asian markets we researched. However, in order to complete our mapping exercise, we used the following source to estimate the number of tech hubs in India: Entrepreneur Magazine survey report. Honestly I really didn’t know there were so many tech hubs in those kinds of countries. It’s awesome now that technology is reaching into these areas that were previously more or less cut off. Technology in generally will be able to explode over the next decade or so as a result. Well, Good post. Thank you very much for share this nice post. Keep up great writing. That’s Great! Thanks, Ecosystem Accelerator for sharing with us this informative article. or offline and communicate from anywhere in Africa. Before it use to be out of reach. Where can we find the actual list of tech hubs in Africa? if you would like to get in touch, please send your message to m4d@gsm.org.